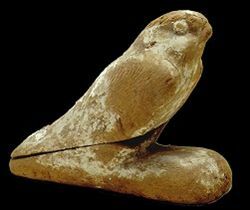 Egyptian funerary god in the form of a falcon. He was mainly worshipped in the necropolis of Memphis, Saqqara. This place is perhaps even named after the god. In addition to the temple at Saqqara, the god also had other cult centres, some of which have not yet been located. At Giza he was the lord of the entrance to the underworld (Rosetau). His sanctuary in the Memphite necropolis was called the Shetyt. Funerary texts from the New Kingdom, such as the Amduat, found in various royal tombs in the Valley of the Kings, mention the kingdom of Sokar 'who is on his sand', a place situated deep in the underworld, in the fourth and fifth hour of the Amduat. As early as the Old Kingdom, Sokar was linked with Ptah, the god of Memphis, resulting in the god Ptah-Sokar, usually depicted as a man with the head of a falcon or entirely as a falcon. As a result of his function as a funerary god, Sokar also had a relationship with the well-known funerary god Osiris, and there are references in many texts to Ptah-Sokar-Osiris. One of the most important funerary festivals in Egypt was the festival of Sokar. It is already mentioned in the first dynasties. From later times we know that the Sokar festival took place in the month Choiak. It was a festival that took place in the middle of an important, 10-day festival that ended on 30 Choiak with the raising of the djed-pillar, and was thus a festival of Osiris. The Sokar festival day, on 26 Choiak, was linked in Ptolemaic times with the winter solstice, which in the Alexandrian calendar also fell on 26 Choiak. Three days earlier, the festival of hacking up the earth was celebrated, an agricultural festival. The festival of Choiak did indeed coincide with the start of work in the fields in the ordinary calendar.